Water quality is a pressing, global issue that is implicated in nearly every human system on our planet. The Open Water project aims to develop and curate a set of low-cost, open source tools that will enable communities everywhere to collect, interpret, and share their water quality data. This is a FAQ about Public Lab's Open Water Project. Join the plots-water-quality mailing list and drop us a line. Where's the main Public Lab wiki page about it? What's the context for the Open Water Project? Access to clean water is necessary for human survival, and vital for the planetary ecosystems upon which all humans depend. Over a billion people do not currently have easy access to drinkable water; many more face significant contamination of their water systems. The recent chemical spill in West Virginia, ongoing threats to Chinese agriculture from polluted irrigation sources, and growing threats to water quality from unconventional extractive industries like hydraulic fracturing all point to an urgent, global need for better access to water quality information that can inform remediation efforts, new policies, and local action. Traditional water monitoring uses expensive, proprietary technology, severely limiting the scope and accessibility of water quality data. Homeowners interested in testing their well water, watershed manager concerned about fish migration and health, and global communities facing toxins in their water supply would all benefit greatly from an open source, inexpensive, accessible approach to water quality monitoring. Moreover, environmental scientists currently have no widely agreed-upon set of water quality data standards or frameworks for sharing data and methods. This makes collaboration among researchers, citizens, and water managers all but impossible, and slows the pace of innovation. How will the Open Water Project work? The Open Water Project team is based in New England, where we plan on conducting our initial pilot tests in Summer 2014. We're also working with partners in Colombia and Rwanda to develop plans for deployment soon thereafter. Who or what will be impacted by the Open Water Project? Broadly, our project impacts everyone who relies on water quality information. Citizens concerned about the safety of their drinking water will gain access to easier techniques for testing and sharing water quality data. Watershed managers will have affordable tools for assessing and addressing their water problems. Researchers will have new, open channels for collaborative research. Policymakers will have a new, rich source of information about trends and correlations that can inform decision making. Current data standards are highly fragmented and infrequently implemented; expensive hardware and proprietary software severely limits the amount of data that may be collected. By creating an open hardware/software solution, we can effectively produce better communication, and facilitate the rapid development of new insights into water quality issues. the number of communities newly able to collect and understand data about their local water quality. What might be the long-term benefits of the Open Water Project? When fully implemented, we will empower concerned communities with ways to collect and understand their water data. On a small scale, this means that rural homeowners will know when their well water has been tainted by the fracking operation on neighboring land, or a farmer in Colombia will know when fertilizer for her crops has polluted the stream that cuts through her property. We cannot assume people will act upon these data, but we can estimate that at least a portion of these people will make changes to ensure cleaner water for themselves and their families and neighbors. Accumulation of these small changes does have the power to create larger improvements within a watershed or collection of watersheds. On a larger level, with enough communities now monitoring their water and participating in the conversations happening on our software platform, individuals and communities will have the ability to combat harmful environmental policies with real data and engaged citizens. Finally by promoting an open, curated and standardized set of hydrology best practices we can catalyze rapid advances in hydrology and the science of maintaining a sustainable, usable global water supply. What inspired the Open Water Project? Members of Public Lab’s global civic science network have increasingly expressed concerns about water quality issues like fracking contamination, agricultural runoff, and water pollution. 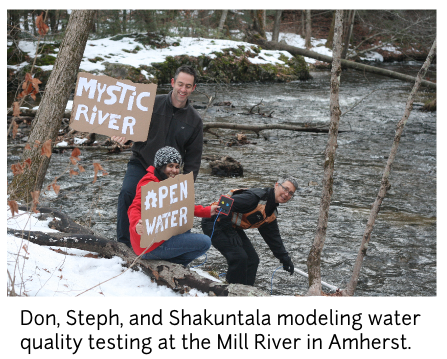 Several among us recognized that an open source, community-based approach to monitoring water quality could have a large, positive impact in these and other areas, and began the Open Water Project. Our initial focus, driven by conversations with hydrologists and watershed managers, was on the creation of a low-cost, easy to use water quality sensor -- our current “Riffle” prototype. Subsequently, we have expanded the scope of our project in order to address larger, systemic issues in the realm of water quality: who will collect and analyze this water quality data? Who retains control of the data? How might these tools be useful for communities in collective action, and in effecting policy changes? Considerations like these led us to recast our project, so that we now envision a synthesis of open source hardware, open software tools, and an open education process that will enable local communities to collect, interpret, and disseminate their own water quality data. We believe that these practices and tools will enable communities to become stewards of their own water systems. We will begin with four pilot projects in New England this summer, with a focus on developing effective, ‘end-to-end’ flows of water quality data. In this initial stage, we’ll characterize our sensor technology, and develop a data collection protocol. Within the next year, our plan is to: build an alpha version of our online software; begin an iterative, co-design process with environmental researchers in building out an open data platform; and explore ways of producing open hardware in ways that can scale globally. Within three years, we plan to make this community-based education and production model more concrete by establishing an educational framework for Open Water ‘labs’ -- a community-based education facility concept. The creation of accessible-yet-effective sensor calibration and validation protocols, and finding ways of rendering community-generated monitoring data that will be acceptable for agencies like the EPA will require ongoing dialogue, collaboration, and a commitment to an inclusive, co-design process. Public Lab’s growing network of civic scientists will be of enormous help in this regard. We’ve so far been funded through a small crowdfunding effort. The selling of open hardware kits, and running workshops may provide other means of support. What are other projects doing similar work? While many projects are focused on enhancing access to fresh drinking water, the Public Lab community’s focus is on the creation of tools that are useful for investigators from a diverse array of interests and backgrounds. Organizing an effective, coherent effort that successfully engages such a diverse community is very challenging; but Public Lab now has several years of experience in fostering precisely such a community, with a broad focus on the development and support of open source tools for environmental monitoring. The Open Water Projects’ focus on water quality has led us to connect projects that share similar goals: Carnegie Mellon’s WaterBot project aims to develop open hardware tools for water quality monitoring, and the OpenCTD project is developing a open hardware prototype for ocean deployment that measures the same sorts of water quality parameters that our Riffle device aims to assess. Our Open Water Project aims to include hardware development as one component of a broadly- collaborative research, development, and user community -- a community that can support other open water quality hardware efforts by leveraging the inclusive, ‘grassroots’ approach to tool development and training found in the Public Lab community. Adrienne Debigare (New Media Catalyst, Boston Globe). Software design lead: Jeff Walker (Ph.D. in "Water: Systems, Science and Society program" at Tufts University). How can I get involved again?